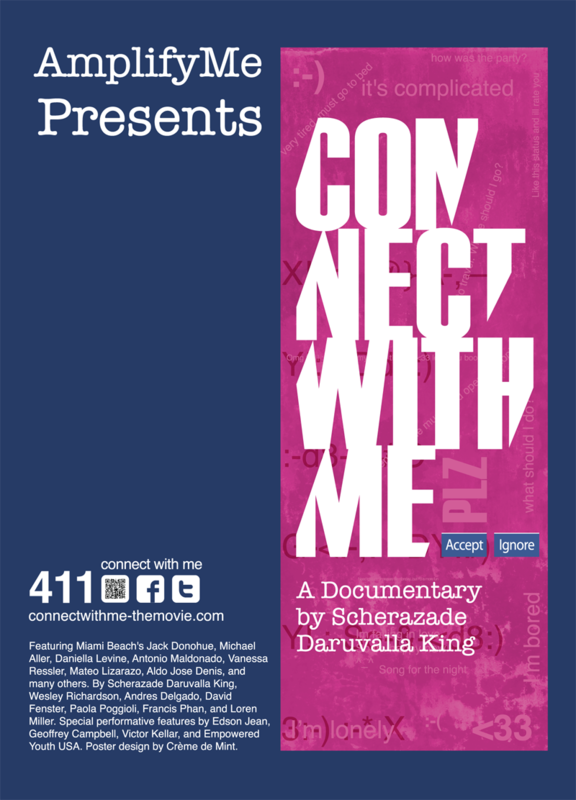 Connect With Me is a performative documentary exploring our connection and disconnection in the highly wired world we live in. Connect With Me is about our connection to media and to each other in a rapidly evolving world. It looks at how people are separating themselves intentionally or unintentionally from the real world in front of them. Visiting all kinds of users in the paradise setting of Miami Beach, employing lively texting graphics and electronic devices, interpolating headlines and news clips about social media, we explore a scrapbook of users, their enablement and anomie, their techniques and coping strategies, and how this world weaves into the broader social transaction. Connect With Me is a performative documentary, which weaves personal accounts or experiences with visual evidence and profound political or historical context. Performance and reality elements have been weaved into the film by way of an international submission contest that helped us to broaden the audience engagement and participatory nature of the project. These entries help stress subjective experience and emotional response to use of mobile and social media of all kinds. This approach appeals to a diverse “mature,” “me,” and “attention deficit” intergenerational audience, a launchpad for constructive dialogue. We approach the subject on the human level, with whimsy, irony, satire, and energy, joining interviews thoughtfully to illustrate various points of view and experiences which entertain, inform, and mirror our viewers' experiences. While no judgments are implied, the point of view which triggers the exploration is that of a concerned mom who raises the alarm at a growing sense of disconnectedness around her, which seems prompted by the use of media technology. Additional funds are needed to add the final touches to the film and to take the show on the road. Specifically, we need online video image engineering, special sharpening, broadcast legalizing, and audio sweetening. In addition, we must create a powerful trailer and provide BluRay and widescreen DVD encoding, duplication and packaging for film festivals, TV programmers, and educational distributor review. Your support in any amount is greatly appreciated and will go a long way in helping us meet our goal. Please make a donation TODAY and help us make a difference!